Gilbert F. "Gil" Shirk was born in 1930 in Elizabethtown, Pennsylvania, the son of Mr. and Mrs. Ralph Shirk. A student at Elizabethtown High School, he proved to be one of the most elite athletes to come out of Lancaster County. Shirk excelled in football, basketball, and baseball and was named County All-Star for all three sports. In the 1948/49 school year, he played a major role in helping Elizabethtown capture the section title and the county championship in all three sports, a Grand Slam, a first by any school in the county. A quarterback/halfback, a forward, and a catcher, Shirk was hailed by his coach as one of “Elizabethtown’s greatest all-around athletes.” At championship games, crowds of thousands would turn out to watch the youngster play. After graduating from high school, Shirk, briefly attended both Gettysburg and Franklin and Marshall Colleges before signing with the Brooklyn Dodgers organization. Brooklyn sent the young catcher to the Hornell Dodgers of the Class D PONY League, where, as he did for the rest of his brief career, frequently was the center of attention. On May 25, 1950 against Bradford, Shirk allowed two passed balls but made up for his defensive blunders by hitting a run-scoring triple in the bottom of the 11th to tie the game. He then came home, sliding in ahead of the tag following a squeeze bunt from 19-year-old Don Zimmer. On June 21, he contributed three hits and scored three runs against Jamestown to extend Hornell's winning streak to eight games. Shirk played 74 games with Hornell and batted .236. In addition to Zimmer, teammate Charlie Neal would also make it to the big leagues. In 1951, Shirk got off to a flying start with Hornell and was hitting .438 over the first 18 games of the season, with 21 hits in 48 at-bats. Although his bat cooled off he still finished the year hitting .266 over 111 games with 71 RBIs. 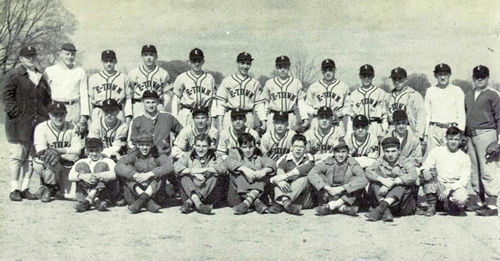 He was selected as a PONY League all-star in September 1951 and at the end of the regular season, Hornell played the Olean Oilers to determine the league title. On September 20, in the sixth and what proved to be the final game of the series for the PONY League Governor's Cup championship, Shirk chose an opportune time to get his only hit of the series, by hitting a double in the ninth inning to score the run that gave his team a 4-3 win. His 1951 teammates who reached the major leagues were Maury Wills, Karl Spooner and John Glenn. One other notable incident involving Shirk occurred during the regular season. On August 30, 1951, a $1,500 suit alleging personal injury and property damage was filed against Shirk by a Wellsville fan. Donald S. Williams claimed his hearing aid was smashed, his clothing torn and his shoulder wrenched by the catcher during a game at Wellsville on July 22. Williams claimed he was sitting in the leftfield bleachers when Shirk, ejected from the game, was being escorted from the park by a policeman. In 1952, based on Shirk's outstanding performance the previous year, the Dodgers organization proposed an enormous jump for the 22-year-old from Class D to Class A, assigning him to the Pueblo Dodgers of the Western League. While he struggled somewhat at the plate, hitting .230 with two home runs, he still played 86 games and continued to show he could be the center of attention. On July 16, during a game against the Omaha Cardinals, Shirk, in a span of three pitches during the first inning, stole second on a triple steal, third on a double steal and then home. The Dodgers finished with seven stolen bases in the inning and won the game, 13-11. Shirk was also somewhat ahead of his time. An August 27, 1952, report in the Greeley Daily Tribune, noted that he wore one finger outside his catcher's mitt. This was many years before the style became popular. Teammates on the 1952 Pueblo Dodgers who went on to play in the majors were Glen Gorbous, Ray Shearer, Joe Stanka and Red Witt. The team was managed by former Athletics pitcher Bill McCahan. Was Gil Shirk heading towards a career in the big leagues? We will never know. He was drafted into military service after the 1952 season and was stationed at the US Army's Aberdeen Proving Ground in Maryland. On May 20, 1953, Private Shirk was driving a car on US Route 40 (Pulaski Highway), three miles north of Perryville, Maryland. He crashed into the rear end of a tractor trailer truck and was killed instantly. His passenger, Sergeant Paul M. Gowel, was severely injured. Gil Shirk was survived by his parents, two sisters, and his wife, the former Jacqueline Hoffman. In honor of his accomplishments, the Gil Shirk Memorial Trophy was dedicated in his memory to award junior athletes on their leadership, personality, athletic and scholastic ability. The trophy was donated by local physician Dr. Troy Thompson. In 2010, Gilbert Shirk was elected to the Elizabethtown Area School District Athletic Hall of Fame.